WINNEMUCCA — About 1 a.m., as July 4th festivities died down, Fred Stewart got an uneasy call from his neighbor. “I think your ranch is on fire,” he recalled the neighbor telling him. When Stewart checked on the fire, he saw that the blaze hadn’t reached his property but was heading that way. Stewart, whose family has worked the historic Ninety-Six Ranch in Paradise Valley for more than 150 years, went out and started opening gates so cattle could get away from the flames. When he checked on the blaze in the morning, the small fire that had developed near the valley about 60 miles outside of Winnemucca — likely from fireworks or campers — had exploded and was running wild across the public land that the Stewarts had long relied on to graze their cattle. “By then, there was nothing anyone could do,” Stewart said. 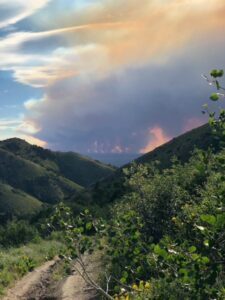 The Martin Fire broke out in the morning hours of July 5th and ripped through dry vegetation to quickly become the largest blaze in the United States, the largest this season and the largest single fire in Nevada history. As of Wednesday night, the fire had burned in more than 439,000 acres, or about 686 square-miles, an amount of land more than twice the size of New York City. It has not only destroyed grazing areas but has damaged an ecosystem for the sage grouse, the bird that has been a focal point of political wrangling because of the impact of its possible inclusion on the endangered species list. On Wednesday, less than one week later, Stewart said that the fire had burnt nearly all of the ranch’s 100,000 acres of grazing land controlled by the Bureau of Land Management. Federal land managers and rangeland ecologists expect there to be lasting impacts on grazing, wildlife and sagebrush habitat in the burned areas, with a full recovery taking up to a decade. “When you have a fire this large, the rehabilitation efforts are going to be pretty massive,” said Jessica Gardetto, a spokesperson for the National Interagency Fire Center. They also said that the fire is indicative of new dynamics on the range that leave more areas open to fire potential and make it possible for fires to grow faster and spread greater distances. A spokesperson for the Martin Fire response team said there was 200 to 400 percent more fuel on the range because of a wet winter followed by a dry winter this year. And even though less-than-average snow fell on the Great Basin this year, there was considerable precipitation in the spring, Gardetto noted, which resulted in vegetation growth. But in turn, an especially hot summer meant that much of the vegetation that grew had dried up when the fire started last week. At times, the 25-mile wide front of the fire moved at 11 miles per hour. High winds contributed to why the Martin Fire moved so rapidly, growing to about 421,000 acres in just four days. Another reason the fire grew to such a large size was the presence of cheatgrass, a highly flammable invasive species that has overtaken much of the range in several Intermountain West states. “Once cheatgrass is dominant, in a sense, the damage is done,” said Erica Fleishman, a professor at Colorado State University who has done work on the Great Basin ecosystem. The flammable invasive species is the most responsive grass to precipitation and once it has grown in an area, it is hard to eliminate. Its seeds are also resilient and grow in burnt areas. Although livestock can feed off of cheatgrass, ranchers prefer other grass species for cattle. The Nevada Department of Agriculture has received reports of burns at six ranches. Ranchers like Stewart, who saw most of their grazing areas burnt by the fire, face tough decisions about how to operate in the coming months and even years. They might have to decide whether to sell some of their cattle or find empty grazing areas in other parts of the state. Through the federal government, some ranchers might be eligible for compensation if their cattle were engulfed or injured during the fire, or if the fire burnt their grazing areas. At this point, there is no estimate for how many livestock or cattle had been killed during the fire. “There has been a disruption and will be a disruption in grazing on affected permittees,” said Sam Mori, a Tuscarora rancher who serves as president of the Nevada Cattlemen’s Association. A huge fire on this range had been primed for years, he said, as more fuel was left on the range. 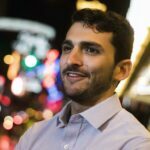 “This country was set up for an event like this,” Mori said. 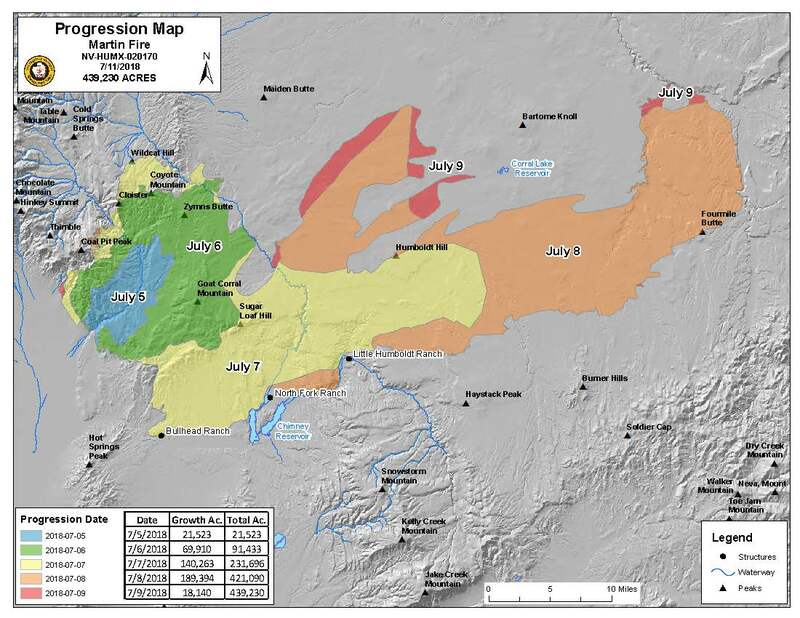 The vast majority of the fire burned in sensitive habitat for sage grouse, land managers have said, and the blaze is likely to be a setback for sustaining habitat for the bird. For years, federal regulators have been working on a conservation framework to boost dwindling populations of the bird and keep it off the endangered species list, which would devastate rural economies. 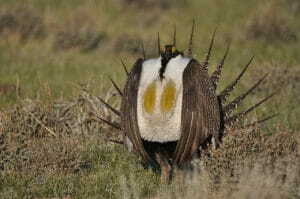 Sage grouse rely on the presence of sagebrush in the Great Basin for protection and food. “When we have these anthropogenic fires, based largely around the fact that we’ve introduced cheatgrass, it becomes a tremendous challenge for the bird to reproduce,” said Brian Rutledge, the vice president and director of the Audubon Society’s Sagebrush Ecosystem Initiative. The concern, among many, is that wildfire will put more pressure on sage grouse populations, which could land the bird on the endangered species list when the federal government revisits the issue. It’s an outcome that many Westerners have worked to avoid for decades. A listing would mean the curtailment of many activities in rural counties, including mining and ranching. The impact on sage grouse could depend, in part, on how the fire burned. Since the burn was not continuous — there was some land untouched — there might be some habitat within the 292 mile radius of the burn that is preserved, land mangers said. Although land managers are still assessing the damage, the fire has likely altered mule deer habitat and other wildlife. At a public meeting in Winnemucca on Wednesday evening, first responders said all of the parties affected by the fire, including ranchers and wildlife managers, will meet in the coming weeks to discuss how to rehabilitate the range and damaged ecosystems. They stressed they would take a collaborative process and undertake projects likely to include seeding and building new fences. “This is going to be a very, very large project,” said Donovan Walker, a fire management officer. But restoration can be difficult and expensive. Fleishman said cheatgrass seeds are so resilient it is hard to prevent the invasive species from growing and crowding out space for native grass. “Restoration is possible in small areas with a lot of labor and financial resources,” she said. Thad Heater, a former state biologist with the USDA’s Natural Resources Conservation Services, said there have been some effective sagebrush restoration efforts. He pointed to areas burned by the Soda Fire, a devastating blaze that eliminated valuable sagebrush habitat in Idaho. According to land managers, the Martin Fire is the largest single fire that has burned in Nevada. The Southern Nevada Complex, a devastating burn in the Spring Mountains near Las Vegas in 2005, burned more acres but comprised multiple fires, whereas the Martin Fire was one blaze. In limited circumstances and on smaller scales, fires can benefit the range. Yet in the case of massive human-caused fires such as the Martin Fire, nearly everyone — ranchers, ecologists and land managers — agree they often destabilize the ecosystem and the activities that rely on it. As of Wednesday, the more than 600 personnel that responded to the Martin Fire had contained about 60 percent of the blaze. Nearly all of the western, eastern and southern edges of the fire have been blunted, but there is a possibility that islands within the boundaries could flare up. 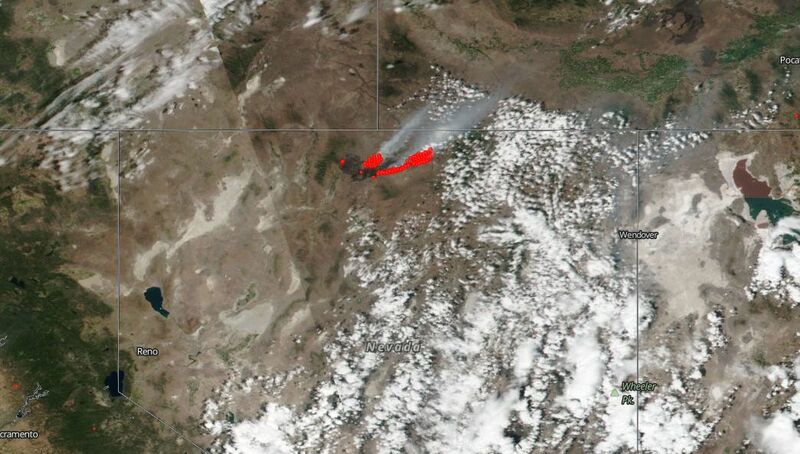 Three smaller fires are burning in Eastern Nevada near the Utah border. Across the country, Gardetto said this season has been above average for wildfires, and it’s part of a broader trend that land managers have observed across the West over the last decade. “What we do know is that over the last 10 and 20 years, we are seeing longer fire seasons, we are seeing more extreme fire behavior” due to cheatgrass and hotter temperatures, she said. The Humboldt County Sheriff’s Office and the BLM are investigating the cause and are asking for tips on an anonymous hotline. Given its proximity to July 4th, many suspect the cause to be fireworks. In the weeks leading up to the holiday, land managers had warned of how fireworks, which are mostly banned on public land, could lead to big wildfires in dry areas across the West. Some Western towns, like Aspen, Colorado, went as far as to forgo firework shows because of the risk. The BLM is offering a $2,000 reward for an arrest and conviction. So is the Ninety-Six Ranch. Stewart said the ranch decided to put out a $10,000 reward for the arrest. To see an ecosystem destroyed that his family has relied on for years was “heartbreaking,” Stewart said. 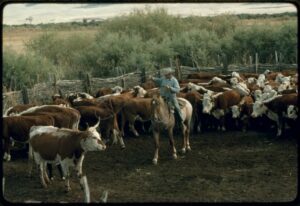 In the 1980s, the ranch was featured in a Library of Congress collection, “Buckaroos in Paradise,” which gathered documents, thousands of photos and hours of video on ranching culture in Nevada. “I’m of the opinion that people should take responsibility for their actions,” Stewart said. Update: The story was updated at 10:50 a.m. on July 12 to indicate that Thad Heater is the former state biologist for the USDA’s NRCS program. Heater is now the coordinator of the Sage Grouse Initiative.